HDFC AMC IPO Review – Should You Invest or Not @ Rs. 1,095-1,100? Should you invest in HDFC AMC IPO or Not @ Rs. 1,100? Reliance Nippon Asset Management Ltd. (RNAM) is currently the only asset management company listed on the stock exchanges. Its IPO came in the last week of October 2017 at a price of Rs. 252 a share. It touched a high of Rs. 335 on January 16, 2018, a low of Rs. 205.35 on June 1, 2018 and is currently trading at Rs. 235.75. At Rs. 235.75 a share, the company has a market cap of Rs. 14,394 crore and its price/earnings (P/E) ratio currently stands at 26.3 times. The company generates an RoE of 22% for its shareholders. In comparison, HDFC AMC IPO is priced at Rs. 1,100 a share. At this price, the company will have a market cap of Rs. 23,319 crore and P/E ratio of 31.46 times based on its trailing twelve months EPS. The company generates an RoE of 33.41% for its shareholders. Also, HDFC AMC is the industry leader in equity-oriented funds, having 51% of its AUM in equities as against 42% industry average. Having 51% of its AUM in equities helps HDFC AMC earn higher management fee for managing these funds. 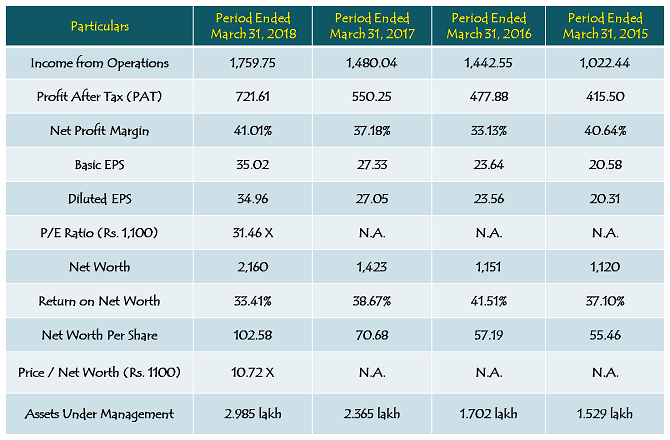 Such high profitability and focus on garnering investors’ money for its high margin schemes justify its rich valuations vis-a-vis Reliance AMC, based solely on the fundamentals attributes of both the companies. However, the biggest factor, that makes investors avoid investing in ADAG group companies, is the quality of their management and the legacy of their actions that have led to the downfall of many of their group companies and the resulting destruction in shareholders wealth. On the other hand, the biggest factor, that differentiates HDFC group companies from their respective industry peers and command a premium in valuations, is the quality of their management and the legacy of their actions that have resulted in a phenomenal growth of all its group companies and the resulting healthy growth in shareholders wealth. Despite of a poor performance of many of its schemes in the last 2-3 years, I expect HDFC AMC to keep growing its business at a healthy pace and maintain its leadership in equity oriented schemes for a long period of time. At Rs. 1,100 a share, I have a view that HDFC AMC is fairly valued, but still leaves a scope of money to be made on listing, and also due to long term sustainable growth in business and profitability. For many of us, HDFC’s year on year consistent growth of 20%+ has been a matter of a case study. So, if 20% is a magical number for the HDFC group companies, then I would expect a 20% listing gain here too with this HDFC group company. Author Shiv KukrejaPosted on July 26, 2018 September 5, 2018 Categories IPO/NFO18 Comments on HDFC AMC IPO Review – Should You Invest or Not @ Rs. 1,095-1,100?